It’s the year 2017 and Donald Trump has been president of the United States for 159 days, or 10.9 percent of his first term in office. So obviously on Wednesday evening he held his first fundraiser for his 2020 reelection campaign. The event took place at his own hotel on Pennsylvania Avenue, a brief motorcade ride away from the White House. Tickets cost $35,000 per person and the fundraiser reportedly raked in $10 million — revenue that will benefit both the Trump campaign and the Republican National Committee. The free advertising for the gleaming, blue-velvet-upholstered venue, of course, is priceless. 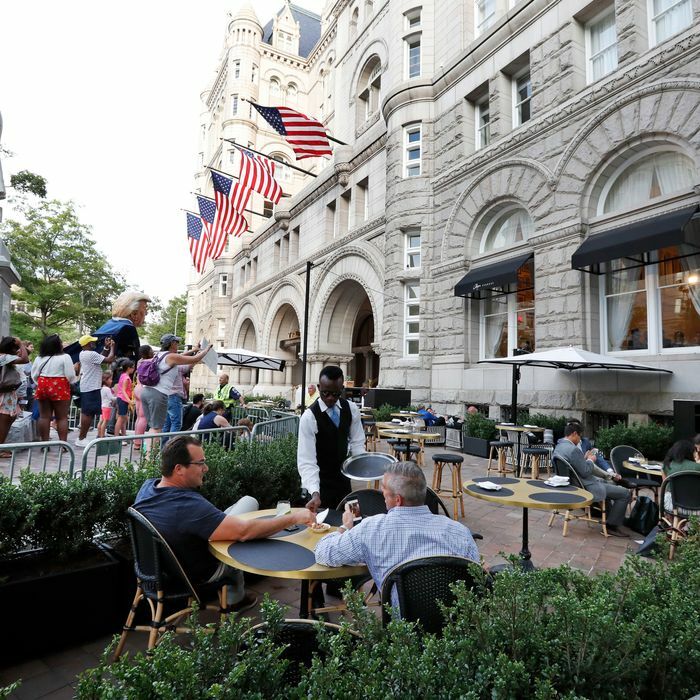 Throughout the most recently completed presidential election (as opposed to the new one that apparently began today) the Trump campaign paid Trump businesses millions of dollars in fees for private airfare, rent, and visits to the Trump Cafe and Trump Grill. By law, candidates aren’t permitted to profit from their own campaigns. However, Trump’s case was an usual one: in all of American political history, no major party nominee had ever used so much of his own money to fund his candidacy and then leaned so heavily on businesses bearing his own gold-plated name. At the time, a federal election commission source told me the process was “basically” a form of “recycling.” Still, as long as Trump is paying what he would charge anybody else to use his own services, he’s technically abiding by campaign finance law. 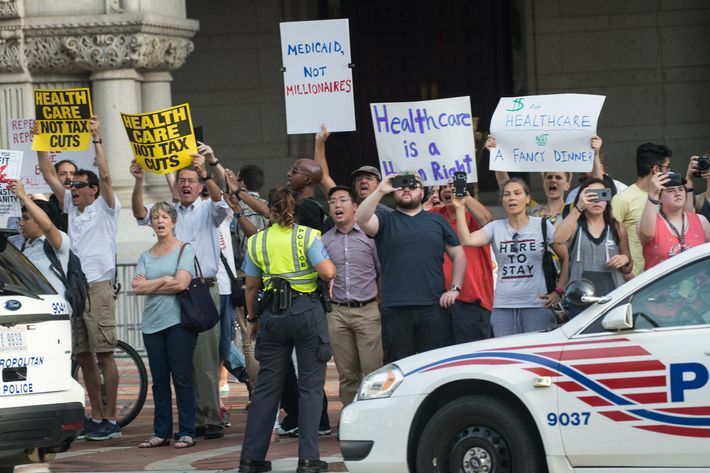 Hours before the president was scheduled to speak, protesters accumulated outside the venue, shouting, among other things, “Your mother would be ashamed!” and “Get a better suit!” From outside the building, several male guests, dressed in suits of unknown quality, could be seen observing the spectacle through the window. They appeared to be raising their glasses to the protesters. Initially, the deputy White House press secretary, Sarah Huckabee Sanders, told the media that they would be permitted to hear the president’s speech. However, a short time after this announcement the invitation was rescinded due to “confusion with the RNC” and “logistical challenges.” Later, when I ran into Katrina Pierson — a former spokeswoman for the 2016 campaign who now works at America First Politics, a nonprofit supporting the administration — she told me the address was “vintage” Trump, a self-congratulatory retelling of the improbable path to his Election Night victory and his perch as the most powerful man in the world. Not permitted to enter the hotel, several reporters including myself congregated at the building’s perimeter, then settled in the patio area of the restaurant, between the party and the protest. Some protesters shouted us down, believing that we were guests at the fundraiser and expressing doubt, once we identified ourselves, that we were members of the media. It’s an oddity of covering Trump that you often find yourself having to be inside his businesses — from Trump Tower to his Las Vegas hotel — in order to be near the story, and frequently without a designated area to conduct your own business of reporting. Eventually, the press made its way inside the hotel. Reporters from pro-Trump outlets to what the president calls the “fake news” media, like CNN, lingered in the Benjamin Bar & Lounge in the lobby, mingling at turns with each other, members of the president’s staff, and stray congressmen. The big-screen TVs hovering over the bar aired sports and Fox News, and the namesake drink, the Benjamin, a concoction of rye, potato vodka, wheat vodka, actual raw oysters, and caviar, went for $100. It’s a bit steep, but what better way to toast to another four years of Trump?